Sgt. Mayan Yogev is probably the busiest paramedic in the IDF: As part of her role as paramedic for the Nahal's scouting brigade, which patrols Israel's Golan Heights on the Syrian border, she has become the IDF's first responder along what has recently becomes Israel's most pressing border region. After a number of strenuous months, during which she took care of hundreds of wounded Syrians, she and her brothers in arms will head south for training. "During the last months she has seen things that your average paramedic sees in a decade," a senior Nahal commander said. "She (Sgt. Yogev) never hesitates. There were dire situations in which she had to give on-the-field care to a victim with a gun shot wound to the head or perform a tracheotomy on 12-year-old girl in critical condition." The IDF refuses to give exact numbers, but according to estimates, Israel has taken in over 800 wounded Syrians. Those in serious condition where taken to local hospitals while others received care in the IDF's field hospital, which was founded last March and is located in one of the army's border outposts. The border has been so busy with wounded Syrians that a reserve medical brigade training in the Golan was sent to aid the makeshift hospital in its workload. Sgt. Yogev, a 20-year-old from Kibbutz Tzova near Jerusalem, does more than offer care for wounded Syrians. As a combat-paramedic she has also participated in IDF operations along the volatile Syrian border, including ambushes, fighting side-by-side with the elite male soldiers of the Nahal. "We weren't surprised," said Yitach, Yogev's brother, "she has a strong character which allows her to deal not just with painful sights but also with difficult challenges without reservation or fear. "When she returns home she goes out and has a good time, she speaks of how much she believes in what she is doing, no questions asked. She tells us how she meets people in dire need of help, and does not embellish stories as heroic. Even as a high school student, she knew she wanted to have a meaningful period in the IDF, offering help and saving lives." Her father, David Yogev adds that "it was always important for her to make a contribution and help other people. Her work over the last few months fills me with pride." Her comrades also shower her with praise, saying "she never hesitates joining forces traveling to the most sensitive areas of the border, giving medical attention to every Syrian who reaches the border without thinking twice – as if they were an IDF soldier. Her goal is saving lives, regardless." Around 50% of those completing the IDF's year and a half pre-conscription paramedics course are female soldiers. 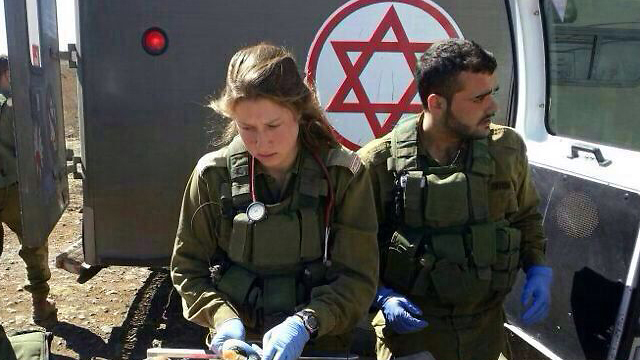 In upcoming months the IDF's medical corps will make history as the first female doctor will join the elite Duvdevan combat unit as its embedded medical professional – serving in both a medical and combative capacity. See all talkbacks "First responder: Meet IDF medic who treats wounded Syrians "